Put some sparkle in her eyes with our vibrant and sparkling bouquet of two dozen of colourful roses. 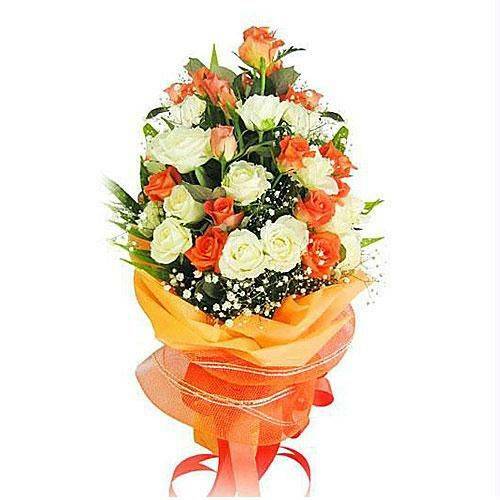 This intensely hued combination of 12 orange and 12 white roses is the best way to show someone that you care. This bunch of 24 colourful blooms will be the best gift for your loved ones- your parents, your spouse, your siblings, your friends, your colleagues on their birthdays, anniversaries and other special days. We have gathered a classic combination of roses and wrapped beautifully, and we are sure that these quintessential shades will surprise your loved ones and fill their houses and with an affectionate aroma. The magic of these fresh and exotic gifts from nature will revive the affection and closeness of the relationship. Order these beautifully arranged vibrant blooms for your loved ones, surprise them and celebrate the moments of your togetherness with glittering eyes and smiling faces.